The U16s travelled to Cardiff this Sunday for a top of the table clash. Having beat Cardiff at home the Kestrels were quietly confident however Cardiff had different plans. No 8 M. Harrhy playing hard and scoring a quick 7 points in the first 5 mins the Cardiff team took a 12-0 lead. Despite numerous chances the Kestrels could not put the ball in the basket and continued to struggle finishing the quarter 22-8. The second quarter Faye Endean found her range and helped the Kestrels get back to scoring, with the Kestrels press in action they were able to make Cardiff rush their shots and gain possession. Although Cardiff’s 1-3-1 Zone was hard to beat the Kestrels persisted and got back into the game. Jess Blandford, Darcy Pafford and Amber O’Reilly was able to give the Kestrels the energy they needed off the bench to win the second quarter and finish the half 8 down. The zone defence continued to work for Cardiff in the third quarter but again Darcy and Amber added some energy to the game back to back 3s for Syd and Faye allowed the Kestrels to stay in the game. Cardiff’s No 10 started to give the Kestrels problems with some great drives to the basket. However, Darcy and Amber once again brought the energy and with a buzzer beater 2 pointer from Amber the Kestrels took their first lead of the game finishing the quarter 46-45. Faye opened up the fourth quarter scoring for the Kestrels however Cardiff were not going to give up on this one and fought hard to take a 7 point lead with just 2 mins remaining. A clutch three from Faye and some great rebounding and put backs by Georgia Taylor allowed the Kestrels to fight back and win the game 63-57. Georgia had to be commended on her 17 rebounds in the game, she never game up and worked hard against a much bigger Cardiff team! The U16s played host to Reading Rockets on Saturday afternoon after a 2 week break with no games. TSK came into the game off the back of a dominate defensive display vs. Wiltshire Demons and would look to keep their unbeaten record alive and it was safe to say the girls were ready for the game and could not wait to step back on the court. In the 2nd quarter the Kestrels continued to execute offensively and swing the ball to find the open player. Charlotte Parkinson showed how much she has improved scoring on the break and playing tough defence. Whilst Georgia Taylor continued her good form in recent games with multiple steals and good decisions on offence. TSK experimented a little on defence allowing Reading to score a few more baskets however the solid offensive output by Kestrels meant another 29 point quarter for the hosts. With another 3 from Syd the home side finished the half 64-24. The 2nd half the Kestrels were not going to let up and offence resumed as normal with some great picks on and off the ball leading to easy baskets for all involved. Defensively TSK continued to compete throughout and all players got on the court and contributed in the game. The final score of 106-38 showed how much the ladies are improving with every game on both ends of the floor. 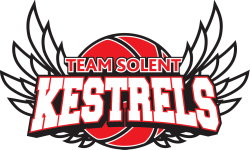 Team Solent Kestrels were led by Syd Baker with 22 points, whilst Amber O’Rielly and Faye Endean had 19 and 16 points respectively. TSK now have a month off in terms of fixtures over the Christmas break and will be back in action on the 14th January 2018 when they travel to Cardiff Met Archers. Reading will also travel to Cardiff for their next game and that’ll be this side of this Christmas break this coming Sunday. Defensively Kestrels locked in with some great defence getting steals and forcing shot clock violations from Wiltshire. However, the Kestrels could not find their offensive rhythm missing easy looks and unable to rebound consistently. Halfway through the half Faye Endean found her rhythm on the Jump shot and a fast break lay up by Syd Baker saw the Kestrels finish the quarter 16-8. The second quarter was much of the same with missed looks inside but some incredible defence holding Wilts to just 4 points in the second quarter kept them at bay. Georgia Taylor, Charlotte Finn and Darcy Pafford helped keep the Kestrels afloat with some nice jump shots and solid finishes in the key. After the half TSK started to find their rhythm offensively, with Amber O’Rielly and Caitlin Collier making sure the tempo stayed up on defence, the team were able to score on the fast break and take the game out of reach for Wiltshire. Next week Kestrels have their last game before the Christmas break facing Reading Rockets, a win will leave them top of the league with an unbeaten record going into the new year.